"This is a recipe given to me by my aunt. The rolls are excellent!" Pour milk into a large mixing bowl, and sprinkle yeast over the surface. Allow to rest for 5 minutes. Beat in the sugar, eggs, 1/2 cup butter, and salt; blend thoroughly. Gradually stir in the flour to make a soft dough. Cover bowl, and set in a warm place until dough doubles in size, about 1 hour. Break off 2 to 3 inch size pieces of dough, roll lightly into round shape, and place in prepared baking dish, edges touching. Repeat to make 36 dough balls. Cover and let rise until doubled in size. Bake rolls in preheated oven until tops turn golden brown, 10 to 15 minutes. 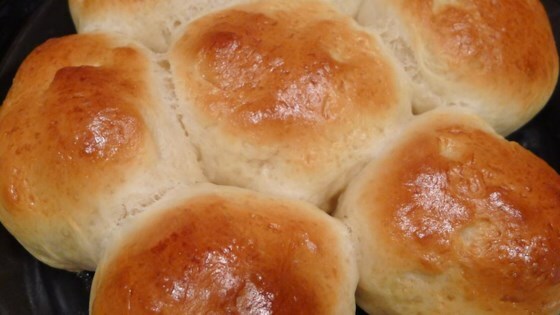 When rolls are finished baking, drizzle melted butter over the top, and serve warm. I am 10 years old and I love these rolls!!!!!!!!! If I had to chose ice cream or these rolls, I would diffenitly chose the rolls.